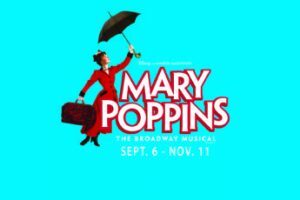 That ever-efficient nanny, Mary Poppins, is flying in and out of Johnstown this season. Harmony Livingston is delightful as the ingenious Poppins who proclaims that she is “Practically Perfect” in every way as she arrives at the George Banks household in London. The family has not been successful in finding a good nanny, as the two children have run off a string of would-be-governesses. Mary is a no-nonsense dynamo that knows just what children need, and how to make them enjoy the transformation. Livingston is given great help by Bert, her longtime friend in fantasy. Cole Emarine is super as the mysterious friend who turns up here and there and everywhere as a friend to all. We originally meet him as an artist displaying paintings in a public park. He then turns up at a local fair, and finally as a chimney sweep who promises good luck to anyone who shakes his (dirty) hand. Livingston as Mary and Emarine as Bert make a very impressive duo. They are both multi- talented, have great singing voices and can dance up a storm. 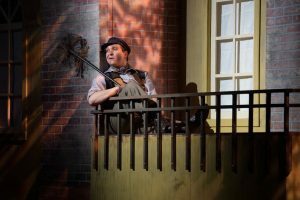 Emarine’s athletic skills have him performing a maneuver that needs to be seen to be believed, dancing with his chimney-sweeping friends late in Act Two. The action takes place in London, on Cherry Tree Lane, at a local park, and at the bank where George Banks works. There is a bit of mysterious magic permeating the show, mostly due to Poppins’ extra-ordinary abilities. When the show begins to lag, a mind-blowing evil Miss Andrew turns up. Referred to as “The Holy Terror,” when serving as George Banks’ childhood nanny years ago, she continues to be an evil and brutal tyrant. When the now-adult George sees her, he immediately flees the home. He has never fully recuperated from being under her care. 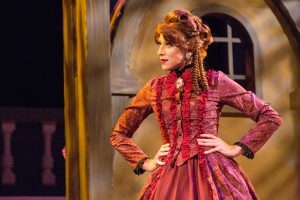 Victoria Pace briefly steals the show in her performance as the dreadful Miss Andrew, appalled that Poppins’ kindness can have any effect on the home. Everyone in the cast is skillful. Scott Hurst is believable as George Banks, the family head who has virtually traded his family for his job. Alisha Winter-Hayes is convincing as the ever-suffering kindly wife who is not pleased with the way her husband treats her and the children, but doesn’t know how to do anything about it. Scotty Shaffer and Annie Dwyer are the household servants whose jobs appear to entail ignoring anything unpleasant going on, and merely do their work. The roles of the two Banks children are double-cast, with Julia Gibson and Gwyneth Bohl trading places as Jane; and Ryan Fisher and John Miley portraying Michael. I saw Bohl and Miley. They both appeared to be at ease on the large stage, mixing well with experienced performers. A well-designed and crafted set displays great detail of the buildings and park. Costumes and lighting are also excellent. Choreography is by Kate Vallee who excels with the chimney sweepers “Step in Time” and with everyone in incredible synchronization for “Supercalifragilisticexpialidocious” (twice!). 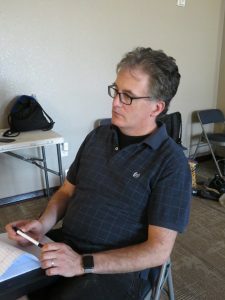 Director Pat Payne has assembled a spirited cast of performers and has carefully used the talents of set designers, costumers, lighting and technicians. He appears to have figured out how to cast a magic spell on the entire show. 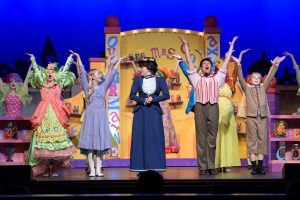 “Mary Poppins,” as seen this season in Johnstown, has music and lyrics by Richard M. Sherman and his brother Robert B. Sherman, with additional music and lyrics by George Stiles and Anthony Drewe. Script is by Julian Fellowes. 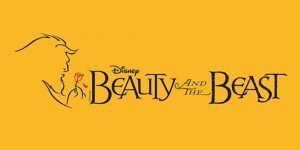 The musical is based on children’s books by P. L. Travers and the 1964 Disney film, using various elements from both sources. Dancing is terrific! Director Pat Payne and Choreographer Matthew D. Peters have rounded up an amazing group of dancers to soar and leap nearly non-stop for two and one-half hours. Opening night audience broke into applause a couple of times during the routines – not even waiting until the end of the dance. When the movie became a Broadway show, it became a hit and ran for more than 1,000 performances, gaining a whole new generation of fans. The production was highly honored, especially for the choreography, and has transferred to the Candlelight stage with great enthusiasm. Some of the older patrons, such as me, who grew with Broadway’s “Sound of Music,” “South Pacific,” and “The King and I” initially had a difficult time. Diction was not perfect early in the show. But once the story line began to make sense, the audience was more appreciative. By the time Act II concluded, everyone appeared to be “aboard,” and curtain call acclaim was exciting. Story is loosely based on an actual strike event in New York City in1899. Newspapers were sold by young men and women, “Newsies,” who had to buy the papers each day, making money only on the papers they sold, as none were returnable. Joseph Pulitzer, publisher of the New York World, realized the paper would make more money if he increased fees the Newsies needed to pay. Kent Sugg is very good as the heartless Pulitzer. Pulitzer went on to great fame and glory with creation of the “Pulitzer Prizes” in later years. In 1899, however, such generosity was not on the horizon. Even New York Governor Teddy Roosevelt, well portrayed by David L Wygant, was not happy with Pulitzer at the time. The plight of the Newsies was made even darker, as the police would pick up young boys for a variety of supposed crimes and have them incarcerated in “The Refuge.” This was a horrific situation, as the boys suffered while the police made government money for each boy they placed. “Newsies” Jack Kelly is the ring leader of the unhappy young newspaper hawkers, encouraging then to go on strike to reverse the fee increase. 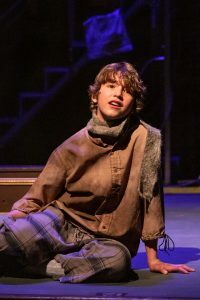 Logan Traver sings well as the unhappy Jack, desperately wanting to escape the plight of New York City, and wishing to re-locate to the site of his dreams, Santa Fe. Traver has a very good singing voice and is an exceptional dancer. Harmony Livingston plays Katherine Plumber, a journalist who is interested in the Newsies plight. It turns out that she has more to offer than Jack Kelly ever imagined. While the cast is universally talented, several performances stand out, including newcomer Hugh Butterfield as Romeo making his Candlelight debut, Ben Welch as the unfortunately handicapped “Crutchie” who is taken to the dreadful Refuge, and Cole Emarine who serves as dance captain. There are 28 performers in the large cast. 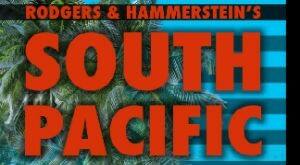 The role of the young Les is played by Tyler Fruhwirth and Hayden McDonald in alternating performances. 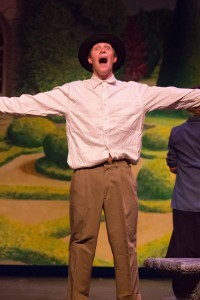 Tyler performed the role opening night and was delightful as the spunky young boy. Choreography continues to be “Newsies” primary claim to fame. Early in Act 2, the audience broke into applause during the “King of New York” routine. 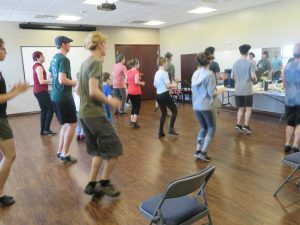 Choreographer Matthew D. Peters put dancers through a “boot camp for dancers” early in the rehearsal schedule, making certain the already-talented performers could maintain their stamina through an exhaustive production. They have learned well, and stamina they have! Pat Payne’s direction of the entire production is excellent. 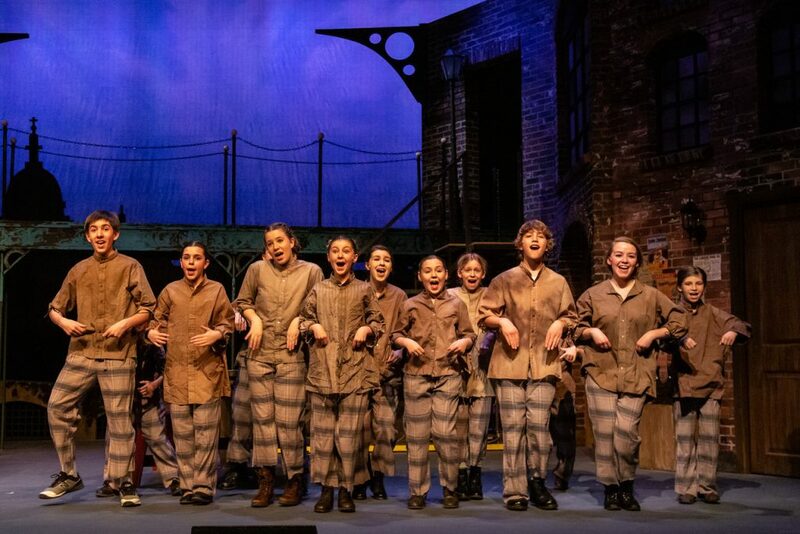 “Newsies” is a joy for fans of the movie, as well as for the older audiences, delighted to learn what all the fuss is about from the younger generations. Another Opening – Another Show! 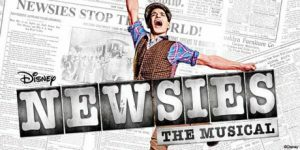 17 days until Disney’s “Newsies” sweeps into Johnstown! 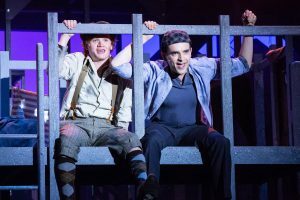 Candlelight Dinner Playhouse Offers Acclaimed Show “Newsies” For Summer Run. I am an unabashed theater fan. I continue to get an adrenalin rush each time I sit in an audience, waiting to be amazed as the lights go down and the show begins, especially musicals. I take for granted the extensive work that has usually gone into making a play or musical succeed. 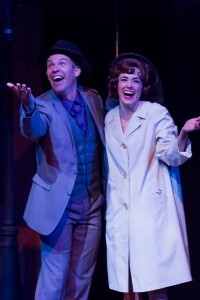 This has been an especially rich season for Colorado theatre, including such wonders as “Ragtime” at Midtown Arts Center, “The Little Mermaid” at Boulder Dinner Theatre Stage, ”Sunday in the Park with George” at Arvada Center for the Arts and Humanities, and the upcoming “Grease” at Midtown Arts. 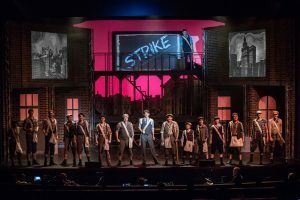 I decided to look into the “making” of a show, and received permission to attend a rehearsal of Disney’s “Newsies,” now in preparation at the Candlelight Dinner Playhouse. 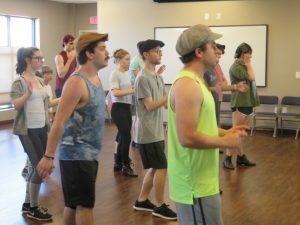 Tuesday, June 12, the entire cast of “Newsies” assembled for what looked to be a marathon rehearsal. The show doesn’t open until June 29, but cast and crew were in full preparation of what has potential of being a seasonal winner. I arrived at the theatre’s rehearsal hall to spend a couple of hours watching the cast go through their paces. There were about 15 ensemble dancers – 12 guys and three girls, plus about ten other performers, all acting, singing, and dancing. “Five, six, seven, eight. Again — one, two, three, four….” Choreographer Matthew D. Peters was counting as the dancers went through the steps time and time again. He knows what he is looking for. He appeared to be a patient man. And no one seemed to complain when he said, “Ok, let’s try it again.” He choreographed, directed, and is in the cast of the currently-running “The Little Mermaid” in Boulder. I did not see the”Newsies” movie on which the theater production was based. Nor did I see the original Broadway production or subsequent touring company. I did see a version of the show last summer at Tuacahn in Southern, Utah, and was thunderstruck by the ten minutes of opening-scene dancing. We are aware that professional athletes train unmercifully, but seldom realize the theater performers have similarly arduous training. The performers I saw rehearsing had already passed the “tryout” period and had been cast for the show. Everyone was doing his or her darndest to hit the steps correctly as Peters counted, “One, two, three, four…” The rehearsal was set to continue for possibly eight more hours that day. 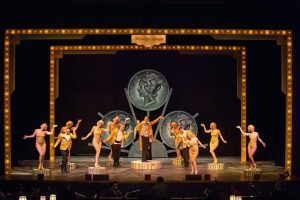 The first scene I saw being rehearsed consisted of just a few bars of an Act Two song and dance, “King of New York.” The routine was being rehearsed as a “soft shoe.” The floor of the rehearsal room cannot withstand the strain of tap shoes which will be featured when the show opens on stage. Visibly helpful during the rehearsal was Stage Manager Malia Stoner who appeared to be everywhere, when needed. On hand to watch the initial dance routine were Harmony Livingston and Logan Traver who are the production’s leads. When they took their places in the rehearsal for the Act Two run-through, they stunned the viewing cast. Their voices are excellent, and their physical chemistry is dynamic. Director Pat Payne has impeccable credentials. He appears to be as patient as choreographer Peters, and the two seem to have utmost respect from the assembled cast. Payne and Peters have put together an incredibly talented group of performers of many ages for this based-on-an actual event show. I didn’t see the set, which is to be a replica of lower Manhattan in 1899. The “orchestra” consisted of a man at a keyboard, and another hitting a soundbox for some recording helps. Lack of scenery, costumes, or orchestra, did not appear to affect the rehearsing performers, who acted, sang and danced as if they were on a stage in front of a large audience. I was in awe of the natural talent in evidence. Some of the faces (and dancing feet) were familiar to me, including Leo Battle, Elliot Clough, Sarah Grover, Eric Heine, Sara Kowalski, Heather McClain, Kent Sugg, Broc Timmerman, and David Wygant. Many have extensive experience at Candlelight and in other theatres in the area. No one appeared to be trying to outdo others in the cast. That afternoon it was as if I was attending a large family reunion where everyone was actually happy to see each other and share their talents! Tempers may have flared later in the day; but while I was watching, the experience could not have appeared more pleasant and normal. And extremely interesting. “Newsies” began as a Disney movie in 1992 based on a real-life newsboys strike in New York City. The musical stage version arrived on Broadway in 2012 receiving great acclaim, including Tony Awards for choreography and original score. While choreographer Mathew D. Peters and his assistant Cole Emarine were counting dancing moves with “five, six, seven eight,” the entire group was counting down the 17 days prior to the show’s opening night at Candlelight. Colorado’s theatergoers’ percentages rank among the nation’s highest. In 2015, 59% of all Coloradoans attended a visual arts event, vs. 39% nationwide. 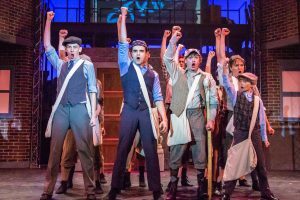 I will be interested to see how I and the thousands of Colorado theatre fans respond to the based-on-reality and soaring choreography of “Newsies,” opening at the Candlelight June 29. For starters, the set is beautiful. The show opens at a Spanish prison dungeon at the time of the Spanish Inquisition where inmates have minimal chance of survival. The show concludes with that same set, but with the background opening on a sky of stars offering a tiny glimpse of hope. In between, the audience is provided with a feast of talent, glorious music, clever visual effects and some inspiration of what humankind just might become. David L. Wygant rules the stage as the poet-actor-tax collector Cervantes. He and his friend, Sancho, are thrown into the Spanish prison awaiting trial, charged with foreclosing on a monastery. The prisoners are a mixed-bag of criminals, eager to steal everything they can from the new inmates, and making fun of their naïve optimism of ever being released. Cervantes then provides his “case,” using the prisoners to play the various roles. His story comes to life in this play within a play. There are sinners, merchants, barmaids, clergymen, government officials and even two amazing horses with personalities of their own. Central to the story Cervantes relates are the woeful Don Quixote and the guttural Aldonza. She is a barmaid used for sexual pleasure by every man in the area. She is hard as nails, but Quixote looks through the exterior, and sees what she could be – a woman of great warmth and intelligence, with the beautiful name – “Dulcinea.” Heather McClain is rough-and-tumble excellent as the shrill Aldonza, not initially believing that she could ever be as wonderful as the Dulcinea of Cervantes’s imagination. Cervantes’s skill as a writer lets him see beneath the surface of everyone – not accepting them at face value, but what they could become. It is a great lesson. The original 1965 Broadway production ran for more than 2,000 performances and received several Tony Awards, including that for Best Musical. It has been revived four times on Broadway and has become one of Broadways’ most cherished shows. Scott Beyette has brilliantly directed the Candlelight production, with great choreography by Bob Hoppe. The wonderful set was designed by Halea Coulter, with Joel Adam Chavez as scenic artist. Lighting is by Vance McKenzie, costumes by Liz Hoover, sound by Mark Derryberry. Dave MacEachen is technical director; Victor Walters is music director. The large cast is uniformly excellent. 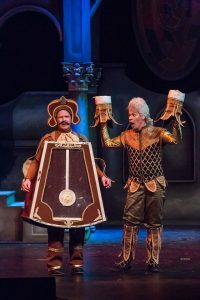 David L. Wygant and Heather McClain are the stars, but receive impressive support from the entire company, including Ethan Knowles as Sancho, Kent Sugg and Thomas P. Castro each in dual roles, Eric Heine as Padre, Ben Griffin as the Barber, George Lemmon as Pedro, and Leo Batlle as Anselmo – just to mention a few. The total effect is a display of brilliance which is becoming the “norm” in Colorado theatres. 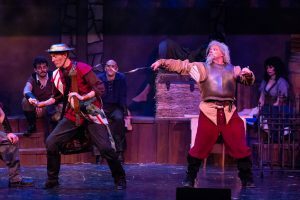 This past season alone has produced such great productions as “Sunday in the Park with George” at The Arvada Center for the Arts and Humanities, “Ragtime” at Midtown Arts Center in Fort Collins, and now the gorgeous “Man of La Mancha” at Candlelight. This is one of Candlelight’s finest productions in its ten years of providing quality entertainment to the area. 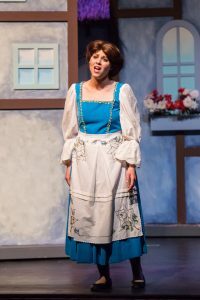 Sarah Grover is Cinderella, coming from a variety of acclaimed performances such as the spunky Little Red Riding Hood in “Into the Woods” at Candlelight. Cinderella in this version of the tale is more downtrodden than ever. With the help of her Fairy Godmother, however, her raggedy dress magically changes into an illuminated blue gown to wear to the ball. Tom Mullin is the king. 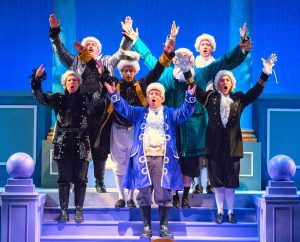 He’s been on Colorado stages for 44 years, and is a daffy delight as the befuddled ruler of the kingdom. Scotty Shaffer and Kent Sugg, David L. Wygant, and Broc Timmerman are back! Shaffer as the over-the-top Montague in the King’s Court, and Kent Sugg bewigged as the King’s mother tottering around in high heels. Timmerman and Wygant are not featured predominately, but are familiar faces and talents. 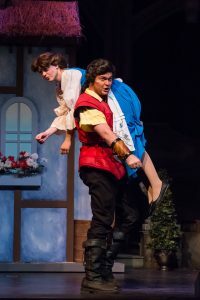 Ethan Knowles is effective as the prince’s friend, John, and Samantha Jo Staggs plays the long-suffering wife of the king. Melissa Morris makes quick costume changes to be Lady Caroline and other women in the ensemble. One of the newcomers to the stage is Furby, an amazingly-trained dog, accompanying Annie Dwyer’s “Fairy Godmother.” Dwyer is very good, and has the good sense to let the dog occasionally steal her spotlight. The magic she weaves and Furby who obeys her every command provide great fun, especially to the many young people in the audience. Whenever she appears, some sort of magic is just around the corner. Visual effects are great, as the Fairy Godmother can prepare a full meal in the “twinkling” of an eye and can transform tacky dresses into beautiful gowns for the dreadful stepsisters. The basic story is so familiar that I felt I was seeing stereotypes of characters I’ve known for generations. Heather McClain portrays the awful stepmother and with Katie Jackson and Rebekah Ortiz as the equally-dreadful daughters. 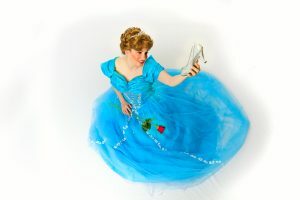 All are talented performers but were unfortunately shrill and annoying as they tormented the hapless orphan, Cinderella. The set, not to be outdone by the experience of the performers, becomes a character on its own. 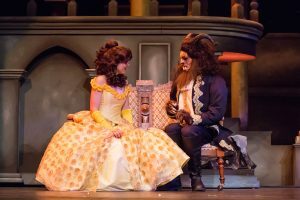 Casey Kearns is credited as scenic designer, with Joel Adam Chavez as scenic artist. The look is very impressive, as are the costumes designed by Debbie Faber, and the lighting by Emily Maddox. Sound by Mark Derryberry is excellent as is the music, under direction of Nicholas Gilmore. Stephen Bertles provides the choreography, including an especially charming ball at the conclusion of Act l.
The movie version of this Cinderella story was released as a British musical in 1976. Songs were provided by the Sherman Brothers – Richard and Robert — who also wrote the scores for “Mary Poppins,” “Chitty Chitty Bang Bang,” The Jungle Book,” and others. When England’s Queen Mother saw the Royal Command Performance of the movie musical in 1976, she noted to the songwriters, “The waltz you wrote for the ballroom scene is the most beautiful song I’ve ever heard.” There is a super sequence in the second act of the current production when the prince, his friend John, and palace servants compare everyone’s role in life, “Position and Positioning.” While the audience doesn’t leave the theatre humming the score, the music has an enchantment of its own. The stage version was created in 1984 in England. It premiered in the USA in 2004 at the Hale Center Theater in Salt Lake City, Utah, but has not been produced frequently in the United States. 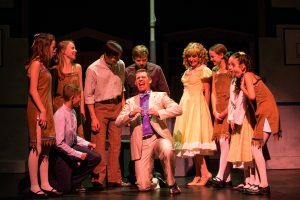 Acclaimed Candlelight Director Don Berlin is respected for his work on a wide variety of productions, with a special interest in bringing little-known musicals to local theatre audiences. This Cinderella version was created 40 years ago. As in other older musicals, this show sometimes becomes bogged down in dialogue — no fault of this very good production but of the play itself. The total effect is a pleasant theatre experience. The show looks and sounds terrific. The experienced cast works hard. The mood swings from being a crazy comic opera in the befuddled kingdom, to the sad tale of Cinderella, to the hope that she and her Prince Charming will ultimately get together — all under the magical spell of the chatty Godmother with her mystical wand. Peggy Sawyer arrives in New York City by train from her home in Allentown. Allentown, PA. She has great naivete, and immense talent, ready to show New York what Pennsylvania can produce. Within a few minutes, Lisa Kay Carter has made the audience realize what a talent they are seeing. 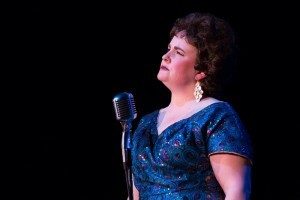 As Peggy Sawyer, Carter shows that she can sing. That she can dance. When does she have time to breathe? “42nd Street” is the proverbial musical about New York City’s favorite area – Broadway and 42nd Street. Talents from throughout the world arrive by bus and train each day, hoping to make their mark as performers. Few of them realize their dreams. But those that do are immortalized by delightful productions like this one, on stage at the Candlelight Dinner Playhouse. Director Pat Payne has a substantial record of directing successful shows, including “Hello Dolly,” “Chitty Chitty Bang Bang,” and “Hairspray.” He continues his run of hits with “42nd Street.” There is every cliché in the showbiz vocabulary: The Broadway ingenue, the ageing diva who everyone loves to hate, the young male dancer and singer who befriends the ingenue, the producer and director who want a hit irrespective of what a toll it may take to create such, the show that is doomed to close before opening unless the right star can be found. And the show’s incredible opening night when everything works to perfection and the audience goes home happy. In the meantime, we are enchanted with non-stop singing and dancing. Tap dancing rules the evening – with every step heading in the direction of 42nd Street. Choreography under care of Kate Vallee, is particularly effective. She has been worked with seven different productions of the show, and her excellence as a choreographer is manifest. 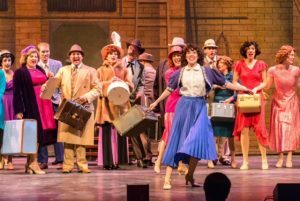 She has expert help with the bevy of dancers to provide enormous fun with “Dames,” “We’re in the Money,” “Lullaby of Broadway,” “Shuffle off to Buffalo,” and an especially interesting “42nd Street Ballet” late in the second act. Set is not particularly interesting until everyone ends up at the Broad Street Station. Lack of scenery is made up for, however, with sensational costuming. Sound and lighting are good, as is the orchestra, under direction of Nicholas Gilmore.” Choral work is also memorable. 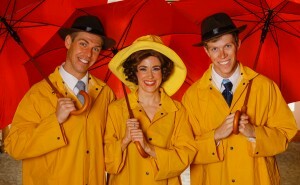 While Lisa Kay Carter as Peggy Sawyer is the show’s star, excellent support is provided by Parker Redford as Billy, David L. Wygant as Julian Marsh, Samantha Joe Staggs as Maggie, Kent Sugg as Abner, and Heather McClain as Dorothy Brock. McClain has a challenging task. She is cast as a comic cliché of the traditional stage prima donna. Her talents are substantial, but she is so likeable that it is difficult to become angry with her character as the over-the-hill diva. “42nd Street” was produced by David Merrick and opened in New York City in 1980. It became an immediate showbiz legend of its own. Choreography was by Gower Champion who had become incredibly successful with ‘Hello Dolly” and other shows. He was ill the last week of rehearsals and died the afternoon before “42nd Street” opened. Following a standing ovation by the opening night audience, Merrick came on stage to tearfully announce that Champion had died that afternoon. Merrick not told the cast before the show, even withholding the news from Champion’s girlfriend Wanda Richert who played Peggy Sawyer. The show went on to receive numerous awards and ran for several years in New York City, and worldwide. The story is based on a novel by Bradford Ropes, and had been made into a 1933 movie, before showing up as Broadway hit about a Broadway hit in 1980. The opening night audience in Johnstown was slow to warm up to the production. By show’s end, however, it was as if they could relax, enjoy super talent, and hear familiar music. They ultimately found boundless joy in the delightful Broadway fable. 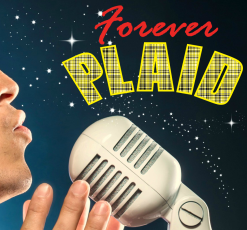 “Forever Plaid” is forever fun! The year is 1928. George Bailey is a bright young man on the threshold of making his mark on mankind. He has been raised in a loving family. His kind father owns a savings and loan company, and has taught George what is right and wrong, what is good and what is evil, and how to treat everyone with respect and kindness. George has finished high school and is set to go to Europe to begin life’s experiences away from his home in Bedford Falls. He plans to enter college upon his return from Europe. Then a lifetime of “skids” begins. “The Wizard of Oz” has been around forever. 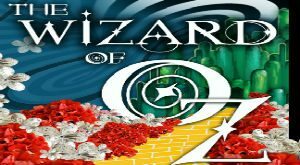 In 1900 L. Frank Baum wrote the American children’s novel “The Wonderful Wizard of Oz” which turned up as the Metro Goldwyn Mayer movie musical in 1939 and immortalized Judy Garland as Dorothy. The film shows up regularly on television; and many in the current audience grew up knowing that Dorothy was swept away in a tornado – or just a bad dream, after her beloved dog, Toto, was taken by a mean-spirited neighbor. The movie begins in black and white, turning to dazzling Technicolor when Dorothy arrives in Oz. 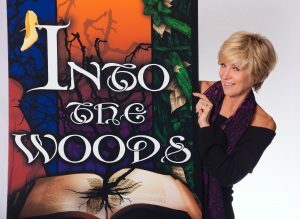 Debby Boone found fame as a young singer in 1977 with “You Light Up My Life.” The song spent ten weeks as No.1 on Billboard charts that year, and she received the Grammy Award for Best New Artist the following year. While she hasn’t been in such great limelight in past years, she has continued to “light up lives” wherever she goes. She is an accomplished performer, writer, wife, mother, and even a grandmother. Her first granddaughter is not yet a year old, and a sibling is expected in the next few months. While in Colorado, she is staying part of the time with her younger sister, Laury, in Fort Collins. 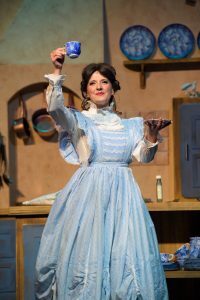 Bussy Gower is delightfully introduced as “A Cockeyed Optimist” early in the Candlelight Dinner Playhouse production of “South Pacific.” Gower portrays Nellie Forbush, a self-proclaimed hick from rural Arkansas. She is serving as an American nurse on a tiny Pacific Island during World War II, and is naively amazed with how different life can be from one part of the planet to another. 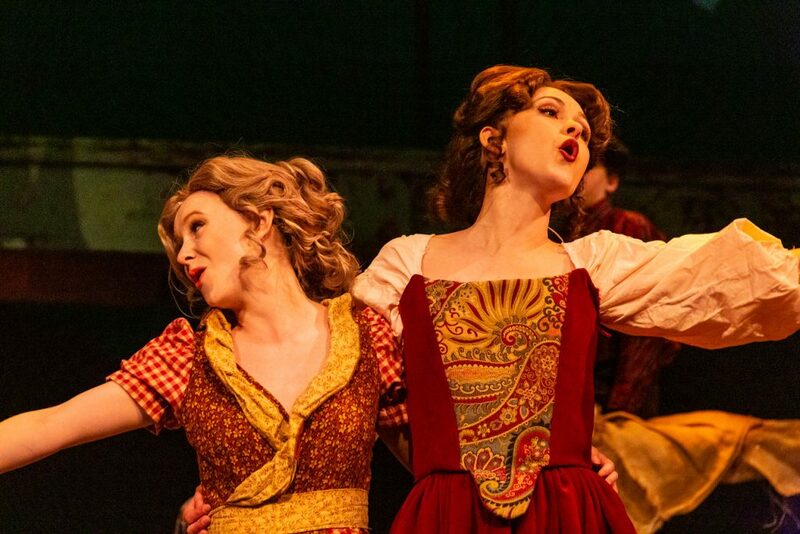 Beth Beyer shines as Dolly Levi in terrific retelling of the matchmaker musical! 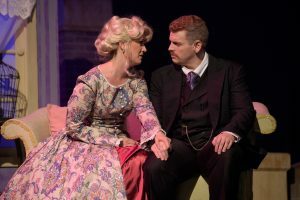 While Beyer reigns as queen of the stage, Kent Sugg is another revelation as the curmudgeon Horace Vandergelder, Yonkers’s famous “half a millionaire” who has hired Dolly to find a wife for him. 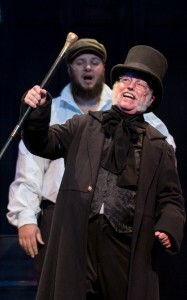 Sugg is another audience favorite in Johnstown, and is at his best in “Hello Dolly.” He is in fine voice and great gruffness as the penny-pinching Horace Vandergelder, not willing to give his staff even an afternoon off work. 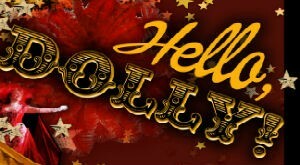 “Hello Dolly” lit up the stage on Broadway in 1964 receiving 10 Tony Awards that year, including being named as Best Musical.” Competition was strong as that was the season that Barbra Streisand stormed the Broadway stage in “Funny Girl.” Dolly was triumphant, however, as critics and audiences were captivated by its vitality, sensational music, and basic charm. Music and lyrics are by Jerry Herman, based on the Thornton Wilder play, “The Matchmaker.” Carol Channing was the original “Dolly.” The performance made her a legend, and she played the role in many different productions over many years. Original direction and choreography were by Gower Champion, who also went on to become a legend, due in great part to his work on “Dolly.” The musical was released as a movie in 1969 with Barbra Streisand playing the lead. The production is a scenic wonder. Lighting is exciting, costumes, and set are brilliant. Voices and dancing share the kudos of an evening of musical fun. 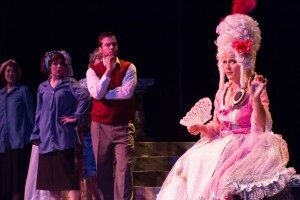 Vocal Music Director is Melissa Swift-Sawyer, with Costumes by Debra Faber and Judith Ernst. Lighting is by Shannon Johnson with Sound by Mark Derryberry. Casey Kearns has designed an attractive set. While Beyer and Sugg are the shows stars, they are given excellent support by several performers. First and foremost is Barret Harper as Cornelius Hackl, Vandergelder’s assistant manager. 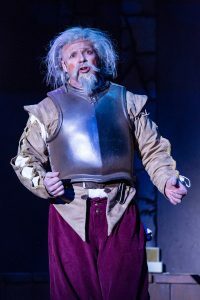 He has been in several regional productions, but has not enjoyed the spotlight he earns as Cornelius. He sings. He dances, He is a super comedian. 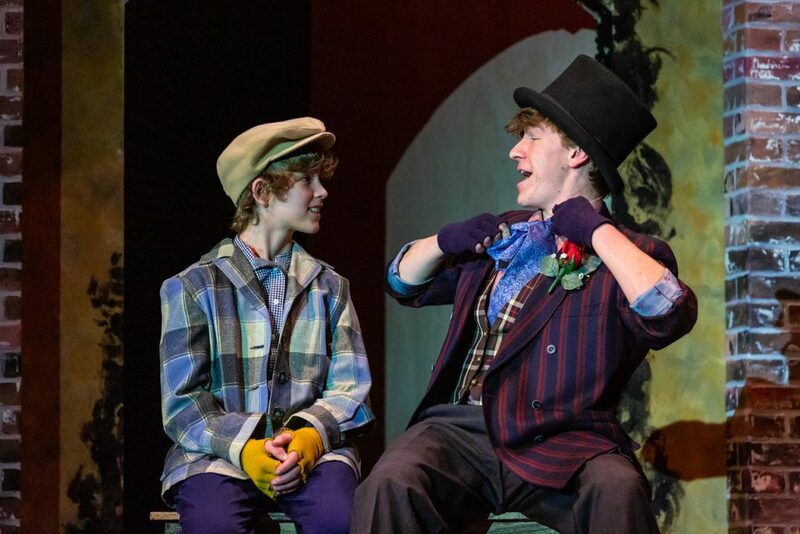 Isaac J. Sprague is also very good as Cornelius’ 17-year-old sidekick Barnaby Tucker, who accompanies his friend to New York with the promise to see a stuffed whale! Hackl and Tucker find a reason to abandon their work, also traveling to New York. They find Mrs. Molloy’s hat shop only nearly to be discovered on the premises by Vandergelder. Alisha Winter-Hayes is very good as Mrs. Molloy ad Melissa Morris s great fun as Molloy’s employee, Minnie Fay. The hat shop scene is a Broadway favorite that becomes more bizarre with each performance. Timing is wondrous, as Hackl and Tucker are hidden by Molloy under the table, in the cupboard, and under the table again – hopefully to hide from their employer who they are trying to avoid. Molloy’s assistant Minnie Fay is naively super, a perfect foil for the also-naïve Barnaby Tucker. 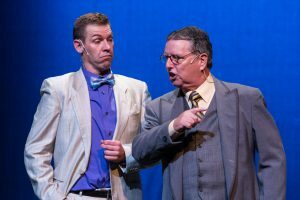 Added to this delightful mix are Eric Heine as Ambrose Kemper and Bussy Gower as an always-wailing Ermengarde who wants only to get married. And then there is the off-the-wall loony Enestina Money, played by Annie Dwyer. Ernestina is a wild-looking woman in need of Dolly’s services as a matchmaker. Act Two is centered around the goings-on in the Harmonia Gardens where everyone ends up after the parade and a long, long walk to the restaurant. The Gardens were Dolly’s old stomping grounds, and the staff is excited to have her return with the famous welcome “Hello Dolly.” This scene is sometimes too frenetic, and the split-second timing to make the dancing more effective will be a result of more experience. Dolly is returning to the Harmonia Gardens, this time in Johnstown, through March 6, 2016. 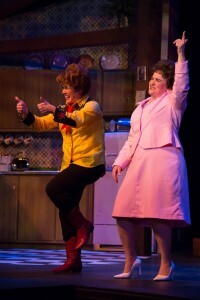 It is rare that dinner theatre patrons rise to the occasion of giving a show a standing ovation. 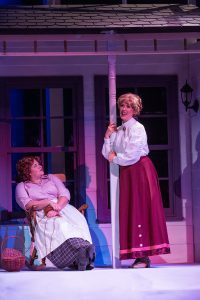 The “Dolly” performance that I saw was the exception, as the theater audience seemed to be as welcoming to Dolly as the Harmonia Gardens patrons, with a well-deserved standing ovation. 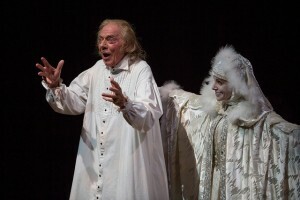 “A Christmas Carol” Offered on Two Northern Colorado Stages! A year ago I was knocked out by an incredible production of “A Christmas Carol” as performed on the Stage Theatre of Denver Center for the Performing Arts. 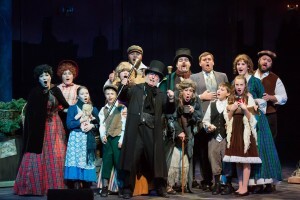 This year two different productions based on the Charles Dickens story are charming audiences in the area! 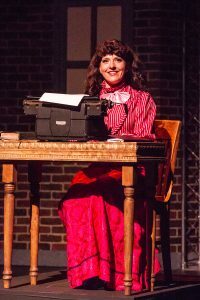 The Denver Center performance is again brilliant, and the Johnstown production at Candlelight Dinner Playhouse is proving to be an incredible crowd-pleaser! I won’t attempt to report which is the better show, but will mention some of the highlights of each show. You cannot “lose” by seeing either one, and it may just be a decision of going to the show nearest to your home. Both shows provide heart-warming “joys” of the season. 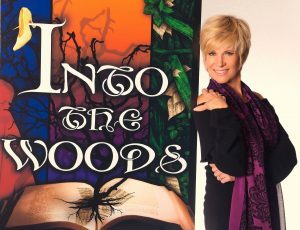 Candlelight Dinner Playhouse in Johnstown offers the musical with music and lyrics by Alan Menken and Lynn Ahrens. This version premiered in 1994, and has been a popular attraction for several holiday seasons at New York City’s Madison Square Garden Paramount Theatre. This is a very family-friendly production. Kent Sugg is wonderful as the tortured Marley. His voice is excellent, as he warns Scrooge that he is about to be visited by ghosts of Christmases Past, Present, and Future. Also in fine voice is Christopher Walton as Tiny Tim. Young performers are sometimes difficult to understand. 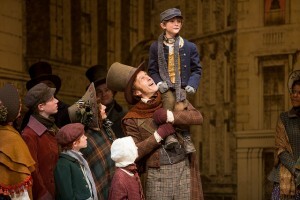 Walton’s stage presence, combined with the Candlelight’s remarkable sound system, make him an immediate miniature “star.” Stephen Charles Turner is convincing as Bob Cratchit, the Scrooge employee who is hesitant to say an evil word about his boss. The set is very good, as are costumes, lighting, and, as mentioned earlier, the wonderful sound. The music is pleasant, but the audience doesn’t leave humming the songs. Choreography by Michelle Sergeeff is very good. The entire production is staged and directed by Patrick Sawyer. This is a heart-felt rendition of the Dickens saga. “A Christmas Carol” at Denver Center for the Performing Arts. Photo Credit: Adams Visual Communications. 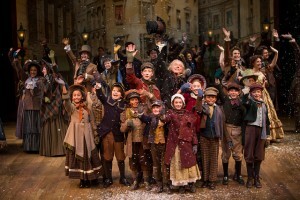 The company of “A Christmas Carol” at Denver Center for the Performing Arts. Photo Credit: Adams Visual Communications. A few miles south of Johnstown is Denver Center’s production, directed by Bruce K. Sevy. This time the story was adapted by Richard Hellesen, with music by David de Berry. 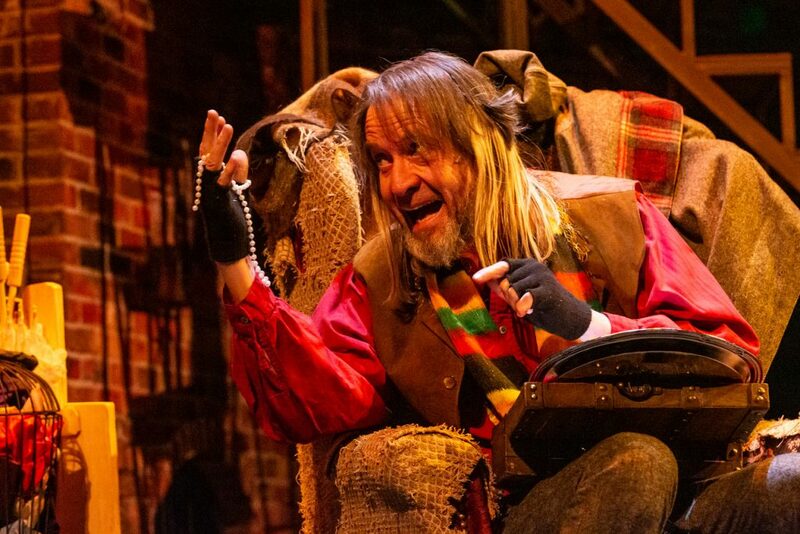 The unhappy Scrooge is played by Philip Pleasants, in his tenth version of “A Christmas Carol” on the Denver stage. 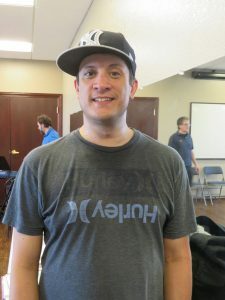 He first played the role in 1978 on a stage in Alaska, and has indicated that this production is his “farewell” to the role which he has immortalized. He is wonderfully greedy, but has enough sense to realize that his life can make some great changes if he heeds the advice of the “ghosts” appearing to him. 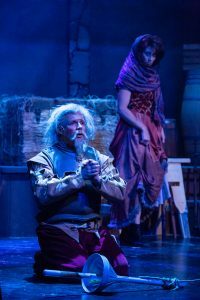 The Denver cast is enormous, highlighted by performances by Pleasants, as well as James Michael Reilly as Bob Cratchit, Jeffrey Roark as the ghost of Jacob Marley, Leslie Alexander as Mrs. Cratchit, and Annie Dwyer as Mrs. Fezziwig. The entire cast is flawless. The Candlelight Dinner Playhouse is a dinner theatre in a beautiful venue, with good food and complimentary parking. The Stage Theatre at the Denver Center for the Performing Arts is a super theatre with nary a bad seat in the house. There is a fee for parking. 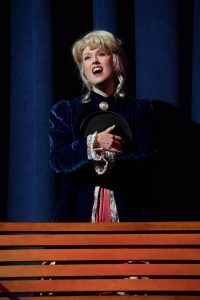 “A Christmas Carol” whether seen in Denver or in Johnstown this Holiday Season is a “Carol” well told and sung – and seen! Yes it rains. Not just a mild sprinkle, but a torrential rain falls upon the stage, thoroughly drenching the dancing lead actor, as well as some of the audience in front rows! At the conclusion of Act I, Don Lockwood, enthusiastically played by Bob Hoppe, has returned from walking Kathy Selden to her home after 24 hours of deliberation concerning what to do with a very problematic movie-in-the making. He is joyful with the plans they have made, and also enthused, as he has fallen in love. A little rain doesn’t dampen his joy. In fact a lot of rain can’t even stop him. The scene from the movie became immortalized by the legendary Gene Kelly more than 50 years ago. The excitement has been transferred to the stage with Don Hoppes’ display of talent, as he sings and dances through a delightfully drenching rain! Hoppe not only stars in the show as Don Lockwood, but choreographed it, carefully re-creating much of the movie’s magic. Don Lockwood’s love interest is Kathy Selden,. His friend and performing partner is Cosmo Brown. I saw Michelle Sergeeff in her first performance as Selden. 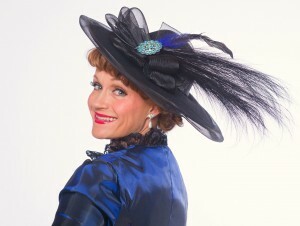 The role is played by Rachel Turner in various performances. David Miller portrays the loose-limbed Cosmo. The three appear to be having the times of their lives on stage, as the performance demands of singing, dancing, and comedic routines are non-stop’. The original movie roles were played by Gene Kelly, Debbie Reynolds and Donald O’Connor. Their portrayals have been so ingrained in our movie memories, that it must be a daunting task for anyone to fill their shoes. Hoppe, Sergeeff, and Miller work exceedingly hard to make the roles come to life on stage! Sergeeff is an incredible dancer. Whereas she has a lilting voice in some songs, dancing is her forte! As a plot catch-up – the year is 1927, when silent films were the the entertainment rage. Hollywood’s Monumental Studios is just opening another successful silent film, “The Royal Rascal,” starring Hollywood’s favorite couple – Don Lockwood and Lina Lamont. This is yet another in a string of successful Lockwood-Lamont films with basically the same plot told over and over and over.. Lockwood cannot abide Lamont who claims they are a romantic couple. . When a competing studio comes up with a movie with sound, “The Jazz Singer,” the industry goes into shock. Monumental boss, R.F. Simpson realizes that his studio must face the opposition, and the movie, “the Dueling Cavalier,” they had just begin to film will be turned into a “talkie” – eventually a musical talkie to be known as “The Dancing Cavalier.” So far, so good. Lockwood has a good speaking, singing voice, but the Lina Lamont is a disaster. She has a horrific speaking voice and can’t begin to carry a tune. Newcomer Kathy Selden is brought in to provide the “voice” of the crazed Lamont, and mayhem ensues. Stephen Charles Turner is convincing as the studio executive, trying to create order out of chaos. Beth Beyer is an enormous delight as the raucous Lina Lamont who everyone believes is incredibly stupid. Not so. She is not only in love with Don Lockwood, trying to hold his affection for Kathy Selden at bay, but is found to be substantially more clever than anyone had imagined.. She is also a wonder to see in action. Her scenes are brilliant – overshadowed only by the amazing dancing which fills much of the evening’s moments. Among the show’s musical highlights are Don Lockwood and Cosmos Brown entertaining as Vaudeville performers to “Fit as a Fiddle,” Lockwood, Brown, and Selden realizing they have talked the night away with, “Good Morning,” and Brown pulling out all the stops in “Make ‘Em Laugh,.” The show’s greatest triumph, however, remains the “Singin’ in the Rain” finale to Act I.
David MacEachen is credited as being Technical Director. I am not certain what this entails, but the show includes several black-and-white movie scenes where problems are faced in synchronizing the film and soundtrack. One of these technical displays is a flawless laugh-out-loud charmer where Lamont’s inability to be understood is enormous fun. The cast is large, including good performances by Scotty Shaffer, Samantha Jo Staggs, Thomas Castro, Melissa Morris and Markus Warren, as well as those mentioned earlier. Jack Barton holds center stage for a few moments with his super tenor version of “Beautiful Girl.” The featured dancers at performance I saw were the always-talented Broc Timmerman and Alisha Winter-Hayes. The orchestra, under direction of Angela Steiner as conductor, had some problems, especially early in the performance. This is unfortunate, and will hopefully be fine-tuned for shows later in the run. The set and costumes are effective, as are lighting and sound., and the set. I wonder how long it takes to dry-out the stage after the heavy rain. Whereas the movie was released in 1952, the stage version did not appear until 1983 when it opened at the London Palladium, starring Tommy Steele. The stage version has gone through several incarnations including a Broadway run in 1986 starring Don Coreia as Don. I saw both of those productions, and was a bit hesitant to see it this time around on a local stage. I erred. 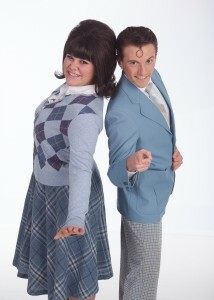 The large cast is immensely talented and the show looks terrific. And for outright exuberance, Bob Hoppe cannot be matched. 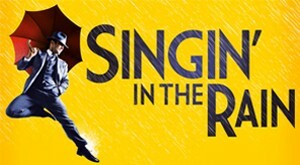 His joy is infectious as he sings and dances “Singin’ In The Rain” in the thoroughly-drenching downpour. When: To July 12, 2015. For fans of the late, great Patsy Cline, “Always… Patsy Cline” will invoke fond memories. For those not acquainted with Cline, the show provides a charming evening of music – country, gospel, and rock and roll! 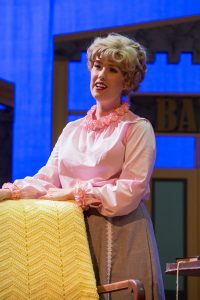 Accompanied by an immensely talented on-stage band that adds to the show’s welcoming ambiance, Melissa Swift-Sawyer is in excellent voice, as Patsy Cline, singing nearly 30 songs made famous by the song stylist in the 60s. From the moment the house lights dimmed and spotlights were focused on the inviting set set and the terrific band, the audience realized they were in for a treat at the Candlelight Dinner Playhouse! “Walkin’ After Midnight,” “I Fall to Pieces,” “Your Cheatin’ Heart,” “You Belong to Me,” San Antonio Rose,” “Crazy,” “Shake, Rattle and Roll,” and even Hollywood’s “True Love” are all included in more than two hours of entertainment. The show was created by Ted Swindley who also directed the original production of the show in 1968 when it became one of the top ten shows produced across the country. Swindley’s credentials are impressive, and his work on “Always, Patsy Cline” is evident, as he has woven an interesting tale to highlight the many songs. It would have been acceptable to have just a show with a talented singer singing songs Cline made famous – for a two-hour concert. Swindley, however, brings Cline to life through the tale related by an adoring fan, Louise Seger, who became a close friend of the singer. Seger first saw Patsy Cline perform in 1957 on the Arthur Godfrey Talent Scouts TV Show. She was immediately impressed by the voice that she heard and followed Cline’s career to the Grand Ole Opry in Nashville. Seger was driving a Houston disc jockey crazy with her never-ending requests to play Cline’s music. He did alert Seger, however, that Cline was coming to Houston for a performance. Seger was there! She introduced herself to Cline, and there was instant rapport between the two! Seger even took her home for the night, to share her son’s bedroom and to cook some bacon and eggs! This was just the beginning of a deep friendship between the single mother, Louise, and the now-becoming-famous, but unhappily married, Patsy Cline! This friendship story intermingled with the wonderful songs. Cline did not write her own music or lyrics for the songs she immortalized. But she had great success in selecting songs that amplified her talents and were appreciated by her audiences. Many of the songs explore lost loves, accepting rejection when a lover moves on, and finding peace with one’s self! The friendship ended tragically when Cline was killed in an airplane crash at age 30 in 1963. By that time she had become one of country music’s greatest vocalists and was a switchover success in other musical milieus. In 1973 she became the first female solo artist inducted into the Country Music Hall of Fame. 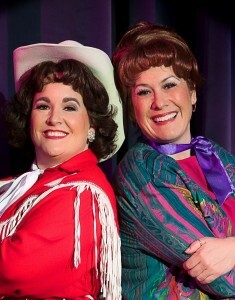 Melissa Swift-Sawyer as Patsy and Alicia Dunfee as Louise Seger are both excellent performers and have great chemistry. Swift-Sawyer sings the wonderful songs, and Dunfee provides a spark that is enthusiastic and rewarding. 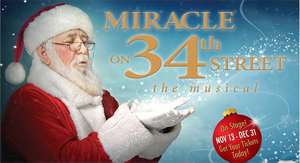 “Miracle on 34th Street” is Reminder that Christmas is Nearly Here! With the arrival of Macy’s televised Thanksgiving Day Parade, can Christmas be far behind? The famous Parade is front and center at the beginning of “Miracle on 34th Street” on the stage at the Candlelight Dinner Playhouse in Johnstown through December 31. The curtains open to a terrifically appealing view of the front of Macy’s Department Store on 34th Street in New York City. The created mood is delightful – parade lovers looking skyward at the large balloons, the clown-costumed technicians doing their best to hold onto the ropes of the balloons. Even the high=-kicking Rockettes from Radio City Music Hall are there! He was spot-on, as the dancing is nothing short of terrific! It was the dancing that caught the audience’s interest in the original movie musical in 1954, especially the barn-raising scene at the county social. The movie, starring Howard Keel and Jane Powell was honored a few years ago by the American Film Institute as one of the best American musical films ever made. This time around Choreographer Stephen Bertles and Dance Captain Tracey Zimmerman-Dennig have created exuberant dances, showcasing the incredible talents of a seasoned cast!